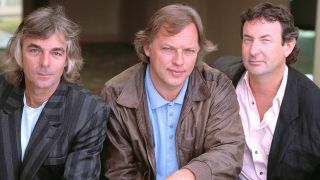 Pink Floyd’s live 1988 album Delicate Sound Of Thunder and 1981 compilation A Collection Of Great Dance Songs are to be reissued on vinyl next month. Both will be released on November 17 via Pink Floyd Records and marks the first time they’ve been available on vinyl for more than 20 years. Delicate Sound Of Thunder was recorded over five nights in August 1988 at the Nassau Coliseum, Long Island, New York, while the band were on tour in support of the previous year’s A Momentary Lapse Of Reason. It features 15 tracks including Shine On You Crazy Diamond, Learning To Fly, Time, Wish You Were Here, Money, Another Brick In The Wall (Part 2) and Run Like Hell. A Collection Of Great Dance Songs features edited and alternative versions of some Pink Floyd classics and a re-recored version of Money. Both albums will be presented on heavyweight 180g vinyl and are remastered from the original analogue studio tapes, while the artwork for both has been faithfully reproduced. Find the cover art and tracklists for both records below.